Nicholas Parsons invites guests to try to speak for 60 seconds on a variety of subjects such as chicken nuggets, conkers, zombies, superfoods, office politics and Hercule Poirot. Who can talk for one minute without hesitation, repetition or deviation from the subject? Who will leap in at the last second to trounce the competition and secure the lead? Find out as we play Just a Minute! With panellists including Paul Merton, Stephen Fry, Josie Lawrence, Julian Clary, Jenny Eclair and Shappi Khorsandi, this series shows just why Just a Minute is one of Radio 4's longest-running and most popular series. 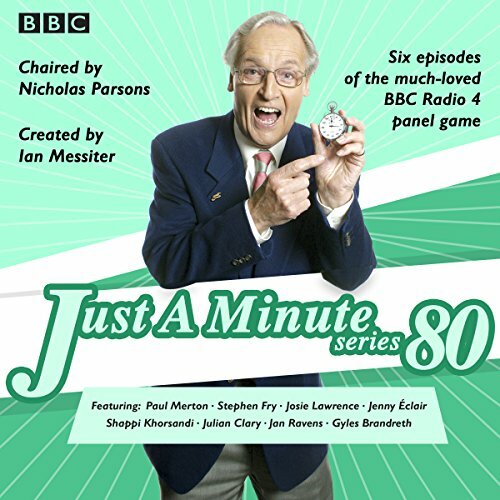 Just a Minute has been entertaining generations of listeners since its first series in 1967 and has been chaired since the very beginning by the inimitable Nicholas Parsons.